Friday is HERE !!! Darn those cravings for anything porky, the meatier/fatter the better !!! Why can’t I find a worthy Bak Kut Teh here in Ipoh? 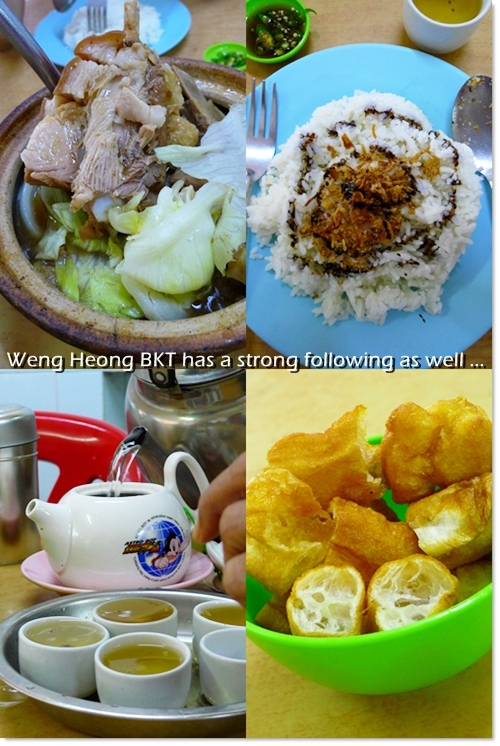 So for today, let’s drool over some of Klang’s (hands down, the CAPITAL of delicious Bak Kut Teh in Malaysia!) signature BKT outlets, strewn all over the town. Last I heard there are HUNDREDS of them in Klang alone. Almost at every nook and corner, every turn of the junction; you know you won’t be deprived of one of Malaysia’s MOST prolific breakfast of choice. Big Bones, Small Bones. No Bones? The various cuts of porky goodness one can pick from a myriad of cuts. If you’re not sure, just ask for recommendations. Or walk over to the counter at the front portion of the shop, and pick your meats. 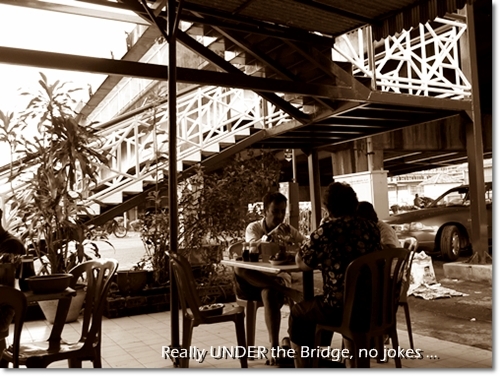 One of the oldest outlet serving BKT in Klang has to be Seng Huat, fondly referred to as the “Bak Kut Teh Under the Bridge“. 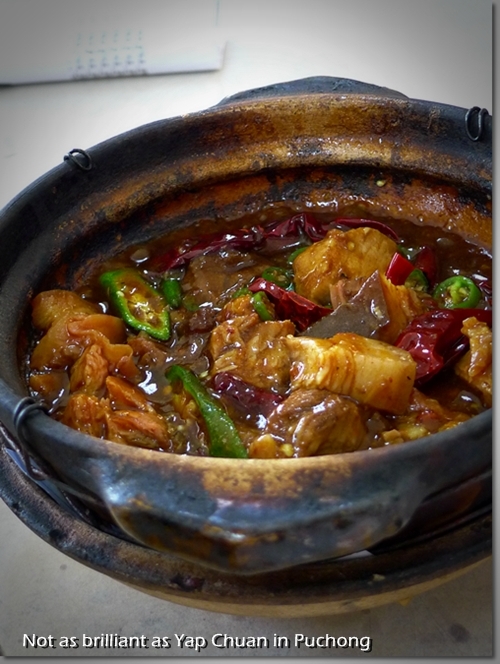 Widely acknowledged as THE origin of Bak Kut Teh by many, this restaurant has been around for more than 60 years! Astounding right? It’s probably the essence of the remnants encrusted at the bottom of the huge pots since decades ago that provides the dark-coloured soup with the much-revered strong herbal tinge, something rarely found in the other diluted copycats. Ask the locals, and chances are, you’d be promptly told that REAL BKT are served in small porcelain bowls, not in claypots. But truth is, I adore claypot BKT as much as the one served in bowls. Or wait, probably more than the latter. For I have grown up eating my BKT served in claypots, and only recently (not as recent actually, about 2 years ago) introduced to its much thicker, darker and robust cousin without any beancurd sheets (foo chook), mushrooms or lettuce. And some do not even serve minced garlic with chopped cili padi (bird’s eye chillies) in soy sauce on the side, as they believe this will only ruin the taste. Personally, I could not imagine having BKT without the bells and whistles (you tiao/Chinese crullers, lots of enoki mushrooms, maybe a few pieces of gelatinous, soft chicken feet, and the almost-compulsory soy sauce+cili padi dip). But to each his own, in this case. Pao Xiang has a rather novel idea of cooking their brand of BKT; tying the trotters and ribs with cotton strings, to expel the fats and prevent the meat from falling off. Interesting? 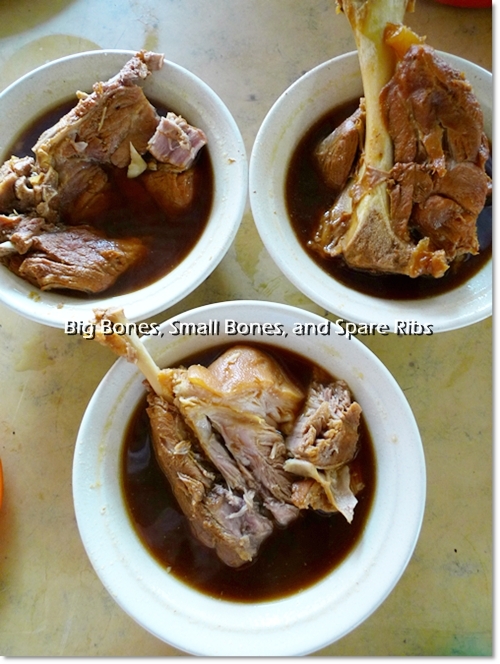 Repeated feasts consisting of irresistible trotters, “big and small bones”, ribs, 3 layered pork, innards, etc cooked in the aromatic broth made from various herbs had me rounding up the countless selections, and came up with this post of BKT in Klang. 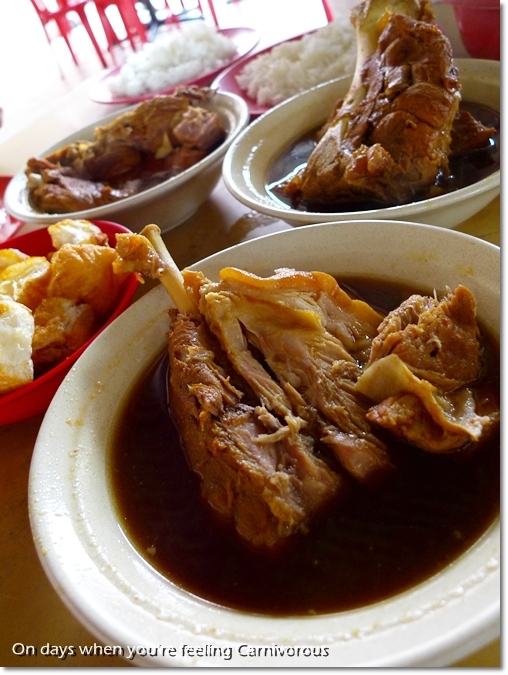 Pao Xiang on the other hand, situated in Taman Kimberley of Klang, serves a rather unusual Bak Kut Teh with Strings. The meat is first tied with cotton strings prior to being cooked, to expel the excessive fats and oils from the pork, as well as keeping them intact through out the laborious process. No doubt first of its kind in Klang, or anywhere else, Pao Xiang has even branched out to various malls in the Klang Valley. But the broth suffered from a lack of oomph, although appearing dark and promising, and served in those classic bowls. At RM7.50/USD2.10 per bowl, you do not get vegetables, mushrooms and the likes in your serving as well. 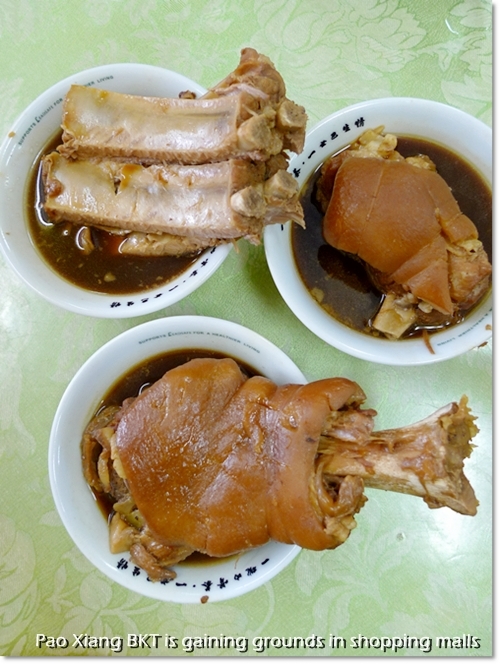 I have posted twice on my personal favourite spot for claypot Bak Kut Teh in Klang; the Teluk Pulai Bak Kut Teh in Taman Intan, off the Federal Highway before you reach Klang town. 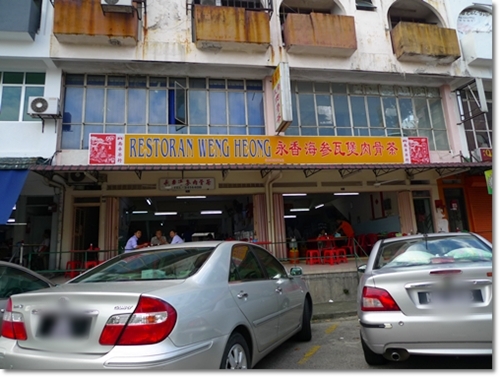 And on both occasions, there were detractors, most complaining about the diluted broth, and commonly compared to Weng Heong next door, which also serves BKT in claypots, and carved a name for themselves by including sea cucumbers in claypot in their menu. If you’re around Taman Intan of Klang, do not worry at all about hunger. For you are looking at at least 8 or so Bak Kut Teh outlets within the vicinity! Weng Heong Bak Kut Teh was indeed delicious, the soup was hearty and flavoursome from all the herbs added, and various cuts of pork thrown in for good measure. The generous portion of pork (we chose lean meat and ribs I remember correctly) served in the claypot was a plus, and the meat was tender yet toothsome. Minor gripes? The rice with onion oil was slightly soggy, and the ‘yau char kwai’ (Chinese crullers) was soft instead of crunchy. But certainly comparable to Teluk Pulai’s version when it comes to the BKT itself, and arguably one of the best in Klang. Bored of the usual ribs and fatty pork? Try some innards for a change. Klang Lek Bak Kut Teh and Teluk Pulai Bak Kut Teh (not to be confused with the aforementioned one, this one is really on Jalan Teluk Pulai) are two other BKT outlets I visited before, and the former was one I patronized more than once. Why? For the DRY Bak Kut Teh of course. 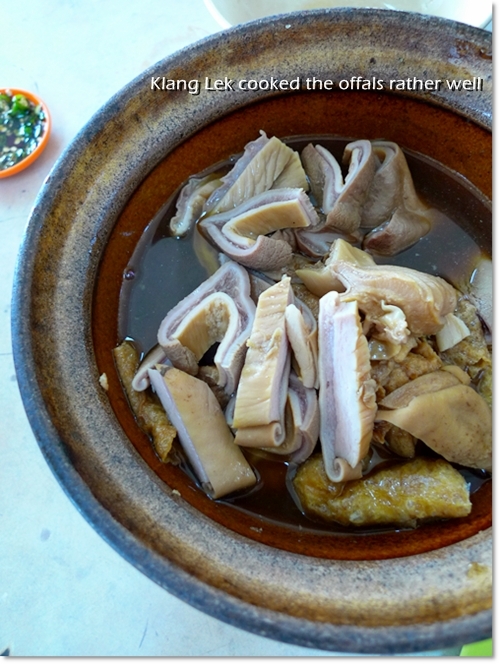 Klang Lek’s version of DRY Bak Kut Teh – But not as stellar as Yap Chuan‘s in Puchong. But second visit to Klang Lek was lacklustre, and even the dry bak kut teh had an unpleasant burnt taste, probably left on the fire for too long. But comparing Klang Lek Bak Kut Teh to Yap Beng in Pandamaran, I’ll pick Klang Lek anyday. Just don’t compare with Yap Chuan of Puchong, for that one was REALLY good. Yap Keat in Subang also does a rather mean version of dry bak kut teh. And Yap Keat opened a branch in Taman Intan as well, next to Weng Heong. Still one of my favourite haunt, though bear in mind that on some days, the broth can get really diluted you’d be wondering did they add water to the soup to cater to the massive crowd? Of course, there are so many more that I’m intending to wallop in Klang. There’s the under-rated yet very popular with the locals; Ah Her Bak Kut Teh in Pandamaran which opens for dinner (go early, about 5-6pm to be safe), and Mo Sang Kor in Taman Berkeley (few shops away from Pao Xiang) and Pandamaran of Klang, as well as a chic & modernized outlet stall in Hutong Food Court in Lot 10. So where’s your favourite spot for Bak Kut Teh in Klang? Unleash the carnivore in you, and go all out, people !!! Happy Weekend !! !